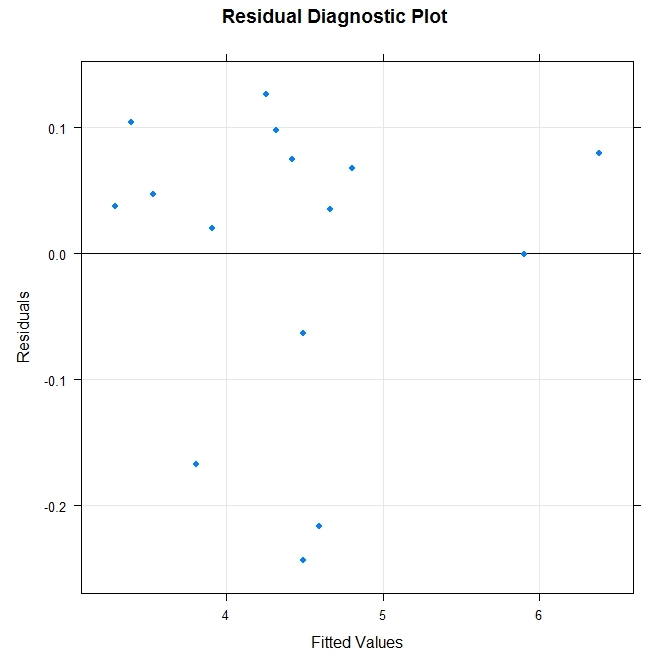 In this post we will consider the case of simple linear regression with one response variable and a single independent variable. For this example we will use some data from the book Mathematical Statistics with Applications by Mendenhall, Wackerly and Scheaffer (Fourth Edition – Duxbury 1990). 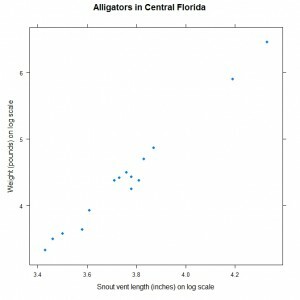 This data is for a study in central Florida where 15 alligators were captured and two measurements were made on each of the alligators. The weight (in pounds) was recorded with the snout vent length (in inches – this is the distance between the back of the head to the end of the nose). 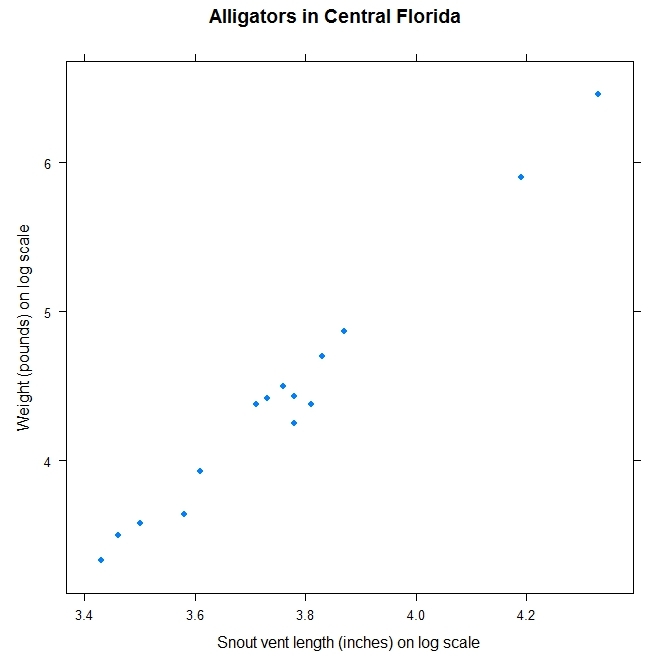 main = "Alligators in Central Florida"
The function lm fits a linear model to data are we specify the model using a formula where the response variable is on the left hand side separated by a ~ from the explanatory variables. The formula provides a flexible way to specify various different functional forms for the relationship. 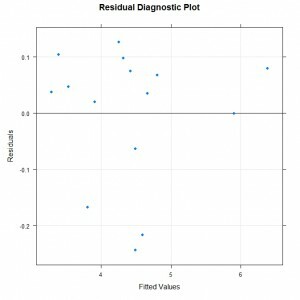 The data argument is used to tell R where to look for the variables used in the formula. We get a lot of useful information here without being too overwhelmed by pages of output. The estimates for the model intercept is -8.4761 and the coefficient measuring the slope of the relationship with snout vent length is 3.4311 and information about standard errors of these estimates is also provided in the Coefficients table. We see that the test of significance of the model coefficients is also summarised in that table so we can see that there is strong evidence that the coefficient is significantly different to zero – as the snout vent length increases so does the weight. Rather than stopping here we perform some investigations using residual diagnostics to determine whether the various assumptions that underpin linear regression are reasonable for our data or if there is evidence to suggest that additional variables are required in the model or some other alterations to identify a better description of the variables that determine how weight changes. We create our own custom panel function using the buliding blocks provided by the lattice package. We start by creating a set of grid lines as the base layer and the h=-1 and v=-1 tell lattice to align these with the labels on the axes. We then create a solid horizontal line to help distinguish between positive and negative residuals. Finally we get the points plotted on the top layer. 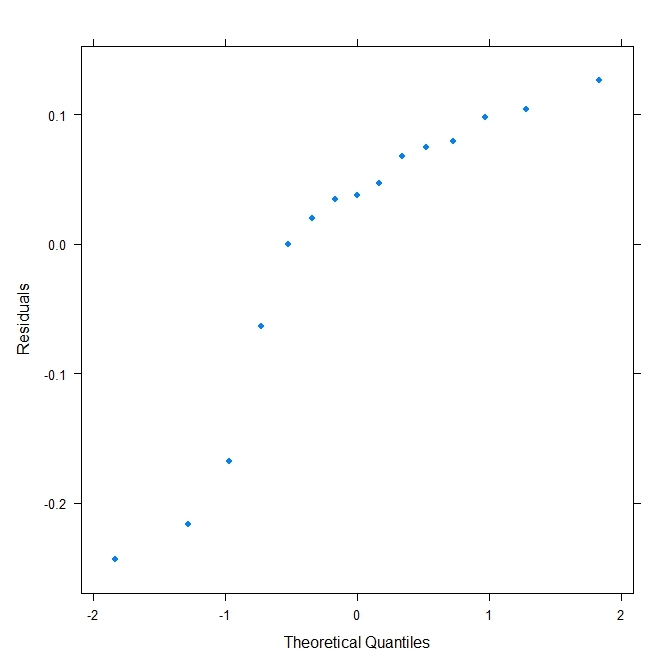 We would hope that this plot showed something approaching a straight line to support the model assumption about the distribution of the residuals. 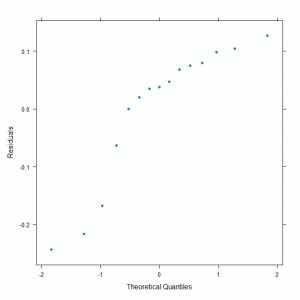 This and the other plots suggest that further tweaking to the model is required to improve the model or a decision would need to be made about whether to report the model as is with some caveats about its usage. I am interested in the thoughts/comments/suggestions from how other people would proceed when faced with this situation – feel free to add in the comments.